What is the Best iPad Air 2 Case With Keyboard Available? The iPad Air 2 is slim, powerful and with fantastic looks, it’s everything that a large screen tablet should be. Add one of the Best iPad Case Keyboards to turn it into the complete productivity tool. Nearly all the current models of the iPad Air are almost the same size. So, the majority of the cases with keyboard that are listed below with fit both the iPad Air and the iPad Air 2. You should check the Apple’s compatibility webpage for more details. Take a look at the Apple Website here. The iPad Air 2 has a great balance of size and weight with a crisp, bright display. iOS 9 runs perfectly, including split-screen apps. It seems like a perfectly portable size. Its software has become better as well. Thanks to iOS 9, its always-powerful processor now gets to handle split-screen apps, and it does it perfectly. It makes it a better tablet. While the new iPad Air 2 still has the same footprint as the original iPad Air (240×169.5mm) it feels by just being so much slimmer makes the new model more comfortable to hold. With a keyboard accessory, the iPad Air 2 is a great portable writing tool. Here are the Best iPad Air 2 Case With Keyboard that you can buy. Anker is becoming well known on Amazon for selling top quality products at fair prices with lengthy warranties. In addition, they back their merchandise with excellent customer service. This keyboard case continues that trend. The most obvious feature of the Air 2 is how light and thin it is. Therefore, a well designed keyboard case should allow the Air 2 to maintain this. This Anker case manages to provide full keyboard functionality with easy Bluetooth pairing in an attractive, light and thin package. Design is key here, and it’s clear that Anker took their time and thought it through. The front and back of the case are an attractive black faux leather that seems like it should prove durable, while the inside is a grey felt material designed to keep the iPad scratch free. The keys are slightly recessed into the felt, meaning they do not come in contact with the tablet screen. The tablet slides into three black plastic holders (one on the left side and one each at the top corners of the horizontal edges) that hold it firmly in place. This provides a minimal but secure hold. The Anker keyboard incorporates the IOS hotkeys with the number keys and requires holding the function key to get the hotkey feature. It includes full iPad brightness controls among the hotkey functions, however, the keyboard is not backlit and I don’t notice. When using the keyboard, there is only one angle for the iPad. This is because the “side” of the iPad needs to connect to the magnetic strip on the keyboard . That “connection” activates the keyboard with the iPad. If you type with the iPad on your lap, this is where the Anker ex cells over the rest because of the better design. When snapped in place on the magnet, the combination of the magnet strength and the strength of the case provides a wedge that’s going to stay a wedge in that position. The Anker case also has magnets that keep the cover securely closed when not in use. Like the Apple smart cover, it also helps add a degree of protection for the iPad screen. The Kensington Key Folio Pro is a premium case made from sheepskin. It has a rich feel and long-lasting durability with a classic folio look. The thin form factor of this case holds your iPad Air 2 securely in place while the ultra-soft interior protects the display from scratches. The Key Folio Pro has a magnetic construction that allows your iPad to be placed at multiple viewing angles. The thin keyboard, with it’s 6 rows of keys, works well on your lap for productivity the go. The Bluetooth keyboard can be paired quickly with your iPad Air 2. When not in use, it folds over the front of your iPad where it is held in place with it’s magnetic clasp. If you are looking for the ultimate in durable cases then look no further than the ZAGG Rugged Book Durable Case. This case features a wireless Bluetooth keyboard in a tough polycarbonate and soft silicone case that delivers unrivaled protection. Keyboard mode – Holds your iPad at virtually angle for fast, accurate typing. Video mode – Reverse your iPad to set it at the perfect viewing angle to watch videos. Case mode – Tough polycarbonate, inlaid with durable silicone, cover provides ultimate protection. Book mode – Reverses the hinge for a convenient book mode while you read. The included lithium polymer battery provides up to two years of typing between charges. 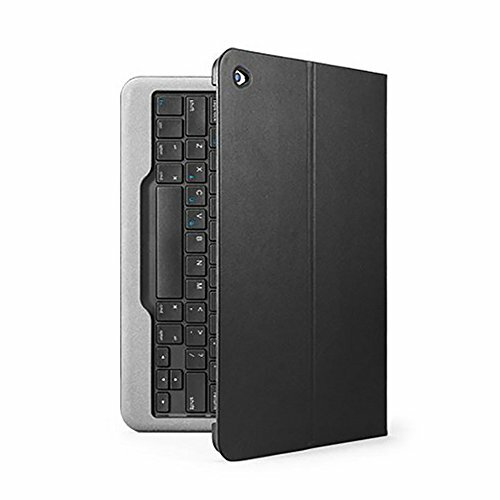 The ZAGG Slim Book Ultrathin Case is an iPad case with a Bluetooth Keyboard. The case is easily detachable and is an ultra-slim solution for your mobile typing needs. The case hinge securely holds your iPad and allows virtually any viewing angle. It allows for a convenient keyboard, video, and book mode, it also folds flat for a protective case mode. Long Lasting – It is claimed that the Slim Book’s powerful, rechargeable battery provides up to two years of typing between charges. This is based on regular use of one hour per day. Using the backlit feature will impact battery life and will require more frequent charging. 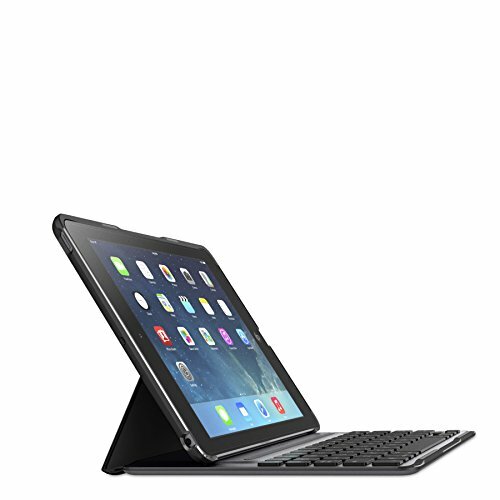 The Belkin QODE Ultimate Keyboard Case is a Keyboard Case for iPad Air 2 that provides complete protection. It is slim, lightweight and combines the protection of a tablet case with the functionality of a laptop keyboard. The QODE keyboard case has been designed with wide, well-spaced keys. This allows you to type faster and more accurately than on a touchscreen. It also includes iPad specific shortcut keys. The magnets that hold your iPad Air 2 in place also give you a choice of three angles for typing or viewing. Additionally, the keyboard can be folded behind the case for handheld use. The QODE Ultimate automatically turn the keyboard on and off, based on your usage, and offers up to six months of active battery life. There is currently a newer version of the iPad case available. The Anker Bluetooth Folio Keyboard Case is a superior case that is functional, attractive and provides a good degree of protection. It is usable in virtually any situation. Add in the six month battery life and this case is a clear winner for iPad Air 2 users. The Kensington KeyFolio Keyboard Case is a perfect compliment to iPad Air 2. The backlit keyboard is a big plus. The iPad fits perfectly inside case. Key spacing on the keyboard is more than adequate for speed typing. Carrying a USB charging cable is highly recommend. What’s your favorite iPad Air 2 Case With Keyboard? From our list of cases with keyboards for the iPad Air 2, which one would you consider? There will surely be more to choose from in the coming months, if none of these are of interest to you. Let us know how your preferences for tackling your typing on the iPad Air 2 by leaving a comment in the box below.